Mother Nature isn’t done with southern Manitoba just yet, as snow continues to fall in most of the region. Friday’s forecast called for an additional five to 10 centimetres of snow, on top of the roughly five centimetres Winnipeg saw fall on Thursday. While the city is out in full force plowing and sanding streets, it’s a different story on the highways. Highway 1 both east and west of Winnipeg is reported to be in bad driving condition, with reduced visibility and slippery sections. At least one accident shut down the eastbound lanes of the highway near MacGregor for about an hour Friday afternoon, forcing a detour through the town. Plowing of major routes within city limits will continue at 8 p.m. tonight, with sidewalk and backlane plowing beginning Saturday at 8 a.m. Bus routes, collector and residential streets will also be plowed. By mid-afternoon, snowfall warnings were still in effect for southwestern Manitoba, including Brandon, Carberry, Treherne, Killarney, Pilot Mound and Manitou. Communities south of Winnipeg were under similar warnings, including Morden, Winkler, Altona, Emerson and Morris. The storm system that’s bringing this latest round of precipitation will mostly end up south of Winnipeg and will move into the U.S., hitting parts of Minnesota before it’s done. If the snow wasn’t enough to dampen your mood, the temperatures are expected to plummet overnight and bring a rash of cold air this weekend. Saturday’s high is -20°C, but will feel near -30°C with the windchill. Sunday is looking pretty much the same with variable cloudiness. A planned opening of the new Westman Laboratory in Brandon was cancelled Friday, as several dignitaries, including Premier Greg Selinger, couldn’t make it to the Wheat City. 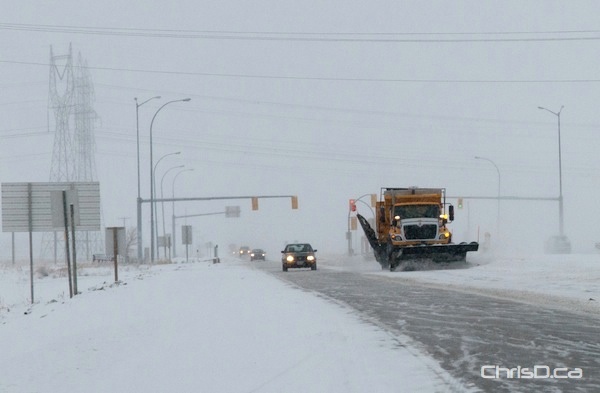 Highway conditions are available on the province’s website at http://www.gov.mb.ca/mit/roadinfo/.